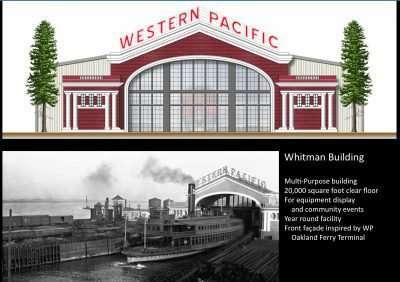 A meeting of the minds took place at the Western Pacific Railroad Museum (WPRM) in Portola on July 13, discussing exciting prospects for the future at the museum. The purpose of the meeting focused on the future Whitman Building, the consideration of ideas for raising funds, awareness and support for getting the building and associated infrastructure such as a parking lot and entry road built. The meeting also focused on the need to solicit assistance in moving these projects forward. Members of the local community may have heard about WPRM’s economic development plan, which includes a multi-event, 20,000-square-foot venue space dubbed the Whitman Display and Event Building (WDEB). The Whitman Building project already has forward momentum, with payments on the 20,000 square-foot prefabricated building being made. Vicknair went on to explain WPRM’s current top three priorities, with the Whitman Building placing first, followed by projects such as the railroad line extension into the heart of Old Town Portola, as well as smaller needed improvements such as high capacity restrooms and improvements to the WPRM entry road. “These are all pieces that tie into the cost of all of these programs,” Vicknair stated. He also noted that WPRM has their eyes on the potential to expand and acquire new properties to prevent the museum from being surrounded by development, and an ongoing partnership with the Old Town Portola Event Center, which ties into WPRM’s goal to help revitalize the community. Vicknair spoke about the need to draw on disparate funding sources to reach project completion, with an estimated total cost projection of $3.5 to $4 million dollars. Vicknair also pointed out the fact that this project is playing off of the area’s native history. Those in attendance at the meeting included Mayor Pat Morton, Councilmember Phil Oels, Rachelle Ramelli of Plumas Bank, Michael and Patty Clawson of Big Fish Creations, Representative Doug LaMalfa’s field staffer Shane Starr, Supervisor Jeff Engel, Feather River Rail Society Director Kerry Cochran and attending telephonically, John Hodgson of the Portola 192 Project. Due to illness, Supervisor Michael Sanchez was unable to attend. The room also included Jim Judd, Rich O’Connell and Mariclair O’Connell of Solar Management. Vicknair segued to a discussion of recent talks WPRM has been engaged in with Solar Management. “I have been meeting with Solar Management for about a month regarding the vast potential in the WDEB redesign, and discussing how these changes could impact the city,” Vicknair stated. Rich O’Connell introduced his team to the room as solar experts looking to help bring opportunity to Portola. Boiled down, Solar Management feels that opportunity is currently knocking on the door at WPRM, especially in regards to the planned Whitman Building. O’Connell touched on some numbers, noting that the planned project would likely need at least one megawatt of power to function, if not two. For reference, a hairdryer uses about one kilowatt. O’Connell also noted the convenience of the orientation of the building at WPRM, stating that the southern exposure of the roof on the Whitman Building façade would be ideal for solar. Solar Management said the idea could also apply to the city in general. “Did you know that 102 years ago, in 1915, they brought electricity to Portola? So here we are, 102 years later, and we’re going to bring renewables! I think that if we use our skills correctly, we can change this thing around and bring prosperity back to the city,” O’Connell enthusiastically said. O’Connell also noted that there was a lot of opportunity to bring in outside money from people that would invest in Portola, and would get a fair exchange for their investment. Solar Management explained how the integration of solar power would benefit investors, delving a bit more into energy costs and the potential savings to be had. “There would be savings right off the bat,” O’Connell said. Mariclair O’Connell chimed in, noting that the revenue brought in by solar energy can quickly rise and the key would be to manage the power correctly. The possibility of bringing in solar would also affect the local employment market, according to Solar Management. 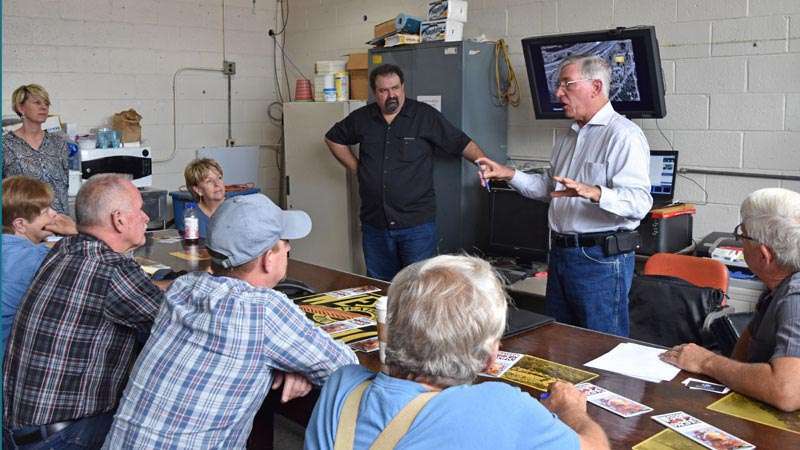 Rich O’Connell stated that he would be interested in talks with the local Workforce Development programs to project how the currently high unemployment rates could be affected. “Solar developments bring in a lot of cash,” O’Connell stated. Jobs brought in to the area would include everything from electricians to caterers for the work site. Mariclair O’Connell added that there is quite a bit of revenue in the production of power from the sun, with a wide variety of ways to utilize it. Vicknair then put the question to the room, “Where do we go next?” Comments included the initial push to get the building paid off and into the first phases of being built on WPRM property, with initial rough estimated costs in the ballpark of $250,000. With ideas flying fast and furious, WPRM successfully carried off its first meeting of the minds, with a wellspring of potential laid out for the consideration of the community.